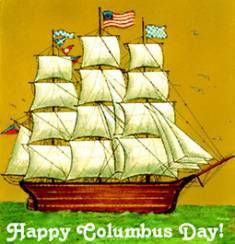 Celebrate Columbus Day with us! And though the disputes on the fact who was the first to discover America are still acute, hardly there is anyone to doubt that Christopher Columbus played a significant part in the human history. That’s why there is no surprise that more and more game developers make him either the hero of the games or exploit his name. While Columbus: Ghost of the Mystery Stone is holding the top lines in our ratings, a new one by cerasus.media was released. In Ancient Spirits: Columbus' Legacy you’re not supposed to wonder as Columbus whose ship crashed on the mystic island, but to explore the ship of the pioneer that is over 500 years-old but still looks like it was abandoned only yesterday. Don’t know the traditions of the Columbus Day? Make your own one – just play a game that is connected with the discoverer!